The title of this post is the same as that of this article on Cambridgeshire Live. t’s a town talked about more for its struggling market than its booming businesses. But more than a thousand people in St Neots have signed a petition wanting to see that end. The petition, which was started by Michelle Woodbridge, a resident from the town, wants the ‘forgotten’ area to be part of a new rail connection between Oxford and Cambridge – which people believe may revitalise the area. It is to the East of the town. The station has a new footbridge with lifts. It has an half-hourly Thameslink service between Peterborough and Horsham, with extra services in the Peak. 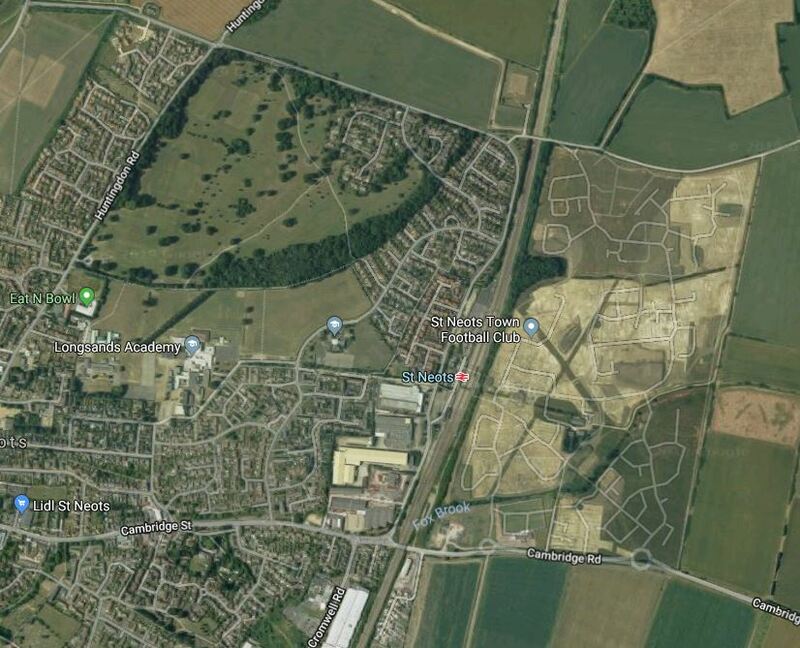 This Google Map shows the Eastern area of the town around the railway station. The large area of development to the East of the station. The A428 road running across the bottom half of the map. The A428 is being upgraded and could become a dual-carriageway route to Cambridge via Caxton Gibbet, Cambourne and Madingley. The East-West Rail Link between Oxford and Cambridge is planned to cross the East Coast Main Line at Sandy and then take a Southerly route to Cambridge South station. The Route Option B is described like this in Wikipedia. Route B involves running from the Marston Vale line to a new Bedford South station before then running to a relocated Sandy (to the north Tempsford area or south of St. Neots). The route heads east to a new station in Cambourne before swinging south to join the existing line northbound to Cambridge. It does seem a bit of a roundabout route, but the new station at Tempsford could be a well-placed Park-and-Ride station for Cambridge. I don’t think that the choice of route between Bedford and Cambridge will be easy. However, certain factors may help in the design of the route. The A1 road runs North-South to the West of the East Coast Main Line. The road is only a two lanes in each direction and probably needs improvement. So the improvements could be done in conjunction with the building of the East-West Rail Link. Much of the East Coast Main Line is four tracks or could be made so, through St. Neots and Sandy stations. Both stations have four platforms. I wouldn’t be surprised to see Sandy station developed into a comprehensiove interchange station, either in its present position or slightly closer to St. Neots. It would be served by the following services. East Coast Main Line services between Kings Cross, the North of England and the East of Scotland. Tramslink services between London and Peterborough. East-West services between Cambridge and Oxford via Bedford and Milton Keynes. It would also be a Park-and Ride station for London, Bedford and Cambridge. This must help increase the numbers of trains on the Route. I just wonder if there was a flyover at Sandy station, if trains could use the East Coast Main Line and the East West Rail Link to create a new service from Cambridge to Peterborough via Cambridge South, Sandy, St. Neots, and Huntingdon. It would suit Greater Anglia’s ambitions and the 100 mph Class 755 trains could handle the partially-electrified route with ease. There could even be a circular service, where trains returned from Peterborough via March, Ely, Waterbeach and Cambridge North. The trains would not terminate at Cambridge, but would go through the three Cambridge stations in order. Four trains per hour (tph), with two going via Sandy and two via Ely could be handled in a single platform at Peterborough. Two tph doing the circular route in both directions would need eight trains. All stations would get at least two tph service to Cambridge and Peterborough. I can see a time when there is a direct service between Peterborough and Cambridge via Cambridge South, Sandy, St. Neots, and Huntingdon. St. Neots would have a two tph service to Cambridge South, Cambridge, Cambridge North, Ely and Peterborough.